Whether we want to admit it or not, romantic relationships are both public and private. Society demands to know how its members fit together. 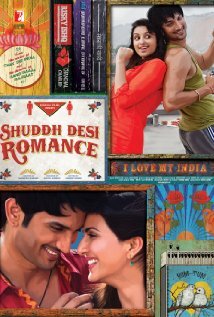 Shuddh Desi Romance (released internationally as “Random Desi Romance“) explores how the social nature of romantic partnerships is changing in India, as arranged marriages fall out of fashion. This exploration takes place via a love triangle involving Raghu (Sushant Singh Rajput), Gayatri (Parineeti Chopra), and Tara (Vaani Kapoor). The story begins on the way to Raghu’s arranged marriage to Tara, an arrangement he agrees to because he figures he’ll never meet anyone else as pretty. On the overnight bus ride to the wedding, Raghu does meet another pretty woman: Gayatri, who, like Raghu, makes a living as a paid guest hired to fill out anemic wedding parties. On the bus, Raghu realizes that he’s made a mistake in agreeing to marry the first pretty woman he meets. Failing to learn his lesson, he immediately falls in love with Gayatri. Raghu flees in the middle of the wedding ceremony under the pretext of going to the bathroom (setting up a running gag throughout the rest of the film). Poor Raghu is semi-permanently flummoxed. He follows his heart blindly, only to emerge from his romantic haze to find that something has gone wrong, and he has no idea why. During his more lucid moments, Raghu is earnest and charming, which is the only reason self-assured women like Gayatri and Tara have anything to do with him. Writer Jaideep Sahni uses a clever trick to allow his young adult characters to explore the meaning of love for themselves: he writes their parents out of the narrative. The only interfering elders are Tara’s overprotective uncle (played by Rajesh Sharma) and the caterer who employs Gayatri and Raghu as wedding extras (played by Rishi Kapoor in a very funny supporting role). The lead actors are outstanding, particularly Rajput, who anchors the story. He manages to make Raghu confused, but not a total dimwit. He’s just way out of his depth with the two women in his life. Parineeti Chopra is something special. Like her character in Ishaqzaade, she again plays an independent woman who falls for a man against her better judgement. As cautious as Gayatri is, she’s just as susceptible to getting lost in the moment as Raghu. Vaani Kapoor is terrific in her film debut. Her finest moment is during her jilting at the altar. When it becomes apparent that Raghu has fled, Tara — clad in her wedding finery — calmly sits in the chair and asks someone to bring her a Coke. It’s such a boss move. In trying to depict a realistic modern romance, director Maneesh Sharma eschews the use of a lot of background music, favoring street noise instead. He also allows conversations and scenes to play out at a slow pace. At times, it feels the audience is given too much time to think about what’s happening, an irony given Raghu’s penchant for acting without thinking. Fortunately, a moderately short runtime keeps the film from feeling too bogged down in exposition. Shuddh Desi Romance is smart, funny, and full of great performances. It’s worth seeing ASAP. This entry was posted in Reviews and tagged 2013, 3.5 Stars, Bollywood, Hindi, Indian, Jaideep Sahni, Maneesh Sharma, Movie Review, Parineeti Chopra, Rajesh Sharma, Random Desi Romance, Rishi Kapoor, Shuddh Desi Romance, Sushant Singh Rajput, Vaani Kapoor on September 6, 2013 by Kathy. Thanks, Shekhar! I amended my post to indicate that “Random Desi Romance” isn’t a direct translation. I’m not sure why they changed “Shuddh” but kept the word “Desi” in the international title. It’s not common parlance in America, and may not be elsewhere, either. Hi kathy, when will you post zanjeer review? Hi, Nav! I’ll post my review tomorrow. I’m going to see Zanjeer in the morning. The movie was nice. Also, the songs are mind-blowing, especially “Gulabi”.